Herself and myself went for a wander around town. We went to the Galeries Lafayette. We went to Printemps. We went to H&M. We had a cup of tea on the quays and went to the bouquinistes where we had a great time poking around for hours and bought many pictures. She’s hung hers up but mine are still stacked up on the mantelpiece. I’d left my phone back at the house so I was slightly worried that the others would be wondering what had become of us. I need not have worried. They seemed to think that we were well able to look after ourselves. We contemplated going to mass in Notre Dame but we were just too scared that we might have to queue to get in so we went to Saint Eustache in Les Halles instead. It’s an odd church. It is described as gothic and it is kind of gothic but it’s the first gothic church I have seen with Corinthian columns. 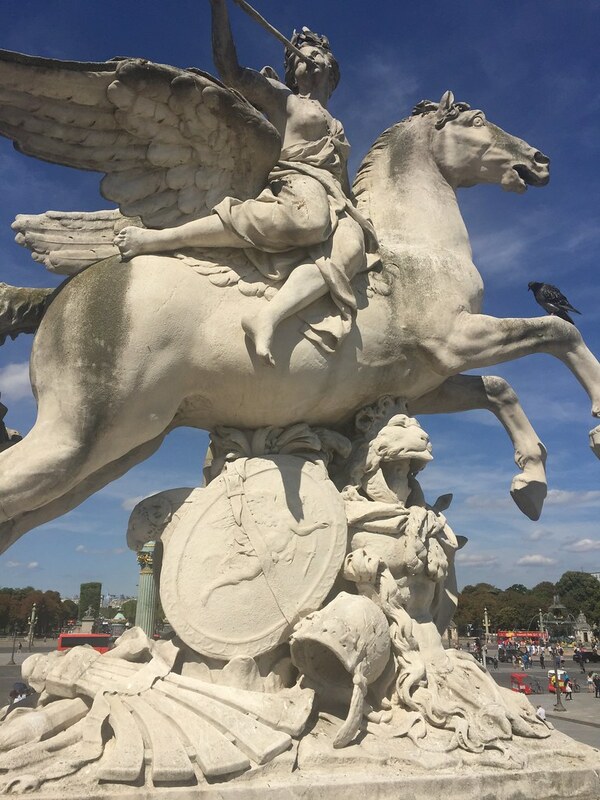 Stand out sight was undoubtedly Louis XIV’s Minister for Finance’s monument. He was so successful at raising taxes for Louis XIV that his funeral had to be held at night so there wouldn’t be riots. The locals appeared to have noticed that he lived pretty high on the hog himself. We went for lunch in Les Halles and then wandered down to the Pompidou centre which could be seen from the outside without queuing. 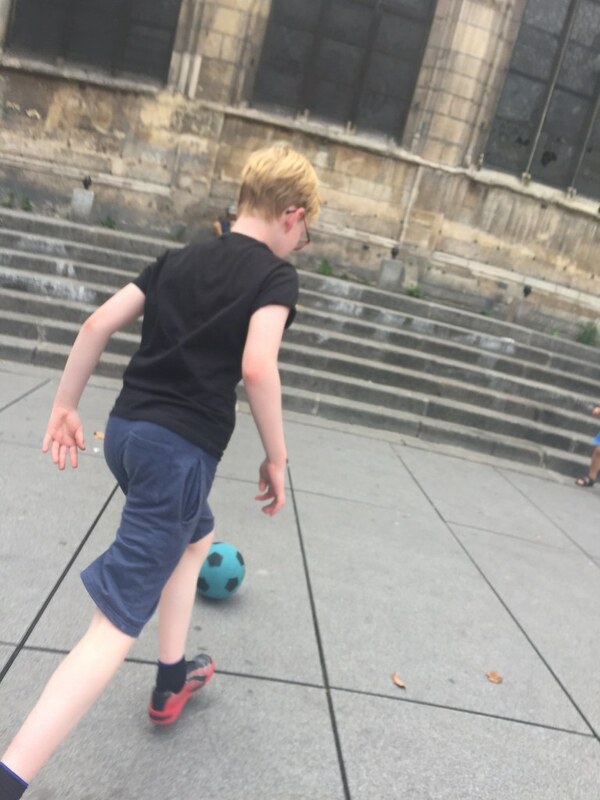 While we had a cup of tea, Daniel befriended a young French child with a ball and he and Michael played happily in the square with him. I decided we would round out our day by taking in the view from the Arc de Triomphe. Not a super spectacular view but, presumably, less in demand for that very reason. No, that is not the case. It turns out that there is a grand big queue to get up the Arc de Triomphe as well. We wandered around the bottom instead. To be honest it’s not really quite the same. When we got home, Mr. Waffle suggested that he and I could go out for a cycle on the French people’s bikes. He offered me the electric bike. I loved it. I always thought that I would get an electric bike for my 50th birthday but now I know that I can’t as if I did I would get no exercise whatsoever. I sailed around the suburbs taking any inclines in my stride. It was just delightful. Mr. Waffle took us to the Cité Universitaire which was nearby (on my super electric bike anyway). I’d never heard of it before but basically all sorts of countries built residences there for their students studying in Paris. Lots of countries represented with a bit of an emphasis on former French colonies. The whole area was green and pleasant with lots of paths for me to test the full power of my electric bicycle. I was so pleased with my bicycle ride that I insisted on prolonging it to inspect Leon the lamp post which is, you know, fine but still a lamp post. 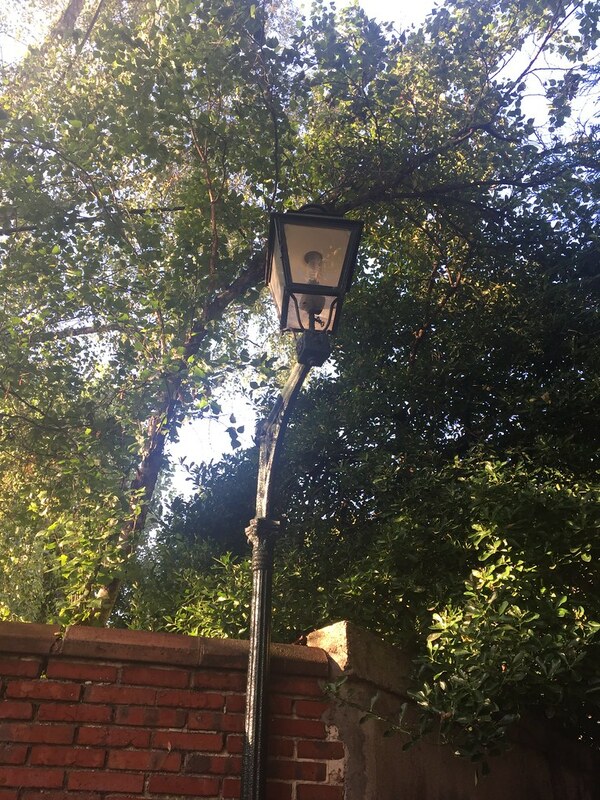 As the lamp post in Narnia, it burns day and night but you really can’t see that very well in day time. To their great relief, Mr. Waffle and I left the children at home alone and went into town together for a wander. 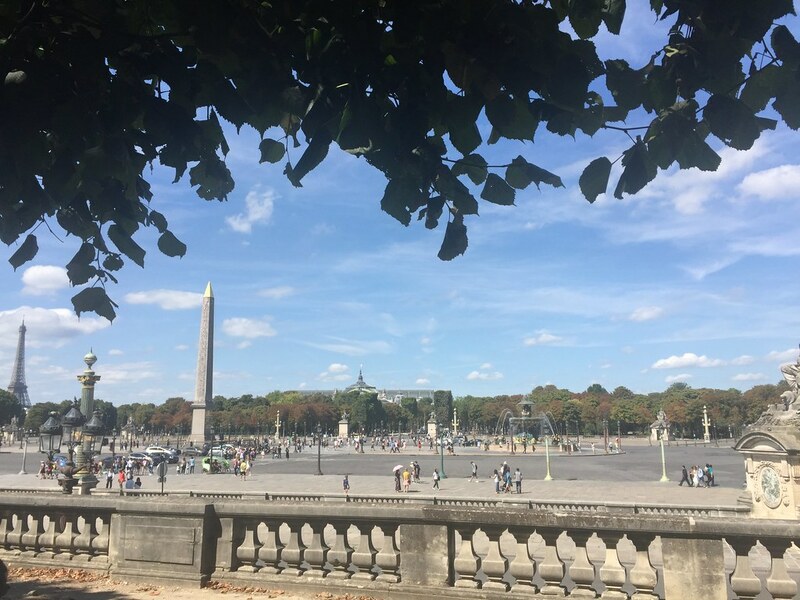 We had a nice breakfast and then went to the Orangerie where put off by the queues for the gallery we sat, instead, under the shade of the trees on those nice green municipal chairs and looked out over the Place de la Concorde [fountains to wash away the blood and all that] and chatted. It was peaceful, it was sunny. We reminisced on the last time we had been in Paris together which was when I was pregnant with the boys and, daringly, we left herself with our lovely Polish cleaner for the weekend. It all went very well and when we came home, she could recite a number of Polish nursery rhymes (we were assured they were nursery rhymes, we weren’t really in a position to know). It was as well that we had had an enjoyable morning. That afternoon we went to Aquaboulevard. Herself had been there before when she was in Paris and recommended it. It turns out that it is much more enjoyable during term time than on Monday 14 August when everyone left in Paris is on holidays (the 15th being a bank holiday and everyone “making the bridge”. If you are unfamiliar with this French term, you haven’t lived.) We pre-booked our tickets. As requested by management the gentlemen of the party bought speedo type togs, as shorts are not allowed. We were ready. In a daring move, we took the tram (public transport abroad other than metros is..exciting). When we arrived, the man at the door asked to see the boys’ swimsuits. They were wearing them so opened their trousers and showed him. We moved on. “Hey,” he said to Mr. Waffle, what about yours?” Hilariously, he too had to show his swimsuit which he was wearing. An auspicious beginning. When we reached the top of the stairs, the man guarding the entrance yelled down to his colleague “Have you checked the English people’s togs?” We ignored the error on nationality. Clearly they had been stung previously by hordes of English people descending in their Hawaiian shorts. The pool itself was heaving. It was barely possible to stand in it, let alone swim in any direction. There were long, long queues for each of the slides. The pools were generally up to my shoulders so too deep for the children to stand in in comfort. Every time I lost sight of one of them (extremely easy to do in the mass of humanity wedged together in the pools notwithstanding the fact that they were several shades whiter than the whitest French people), I was terrified that they had drowned. There was a big sandy outdoor area and an outdoor pool as well as the indoor ones and it was a bit warm outside – this was one of the warmest days we were there which was why we had selected it for our pool day; clearly half of Paris had the same idea. It was pretty hideous. Alas. We returned home and to cheer myself up after our swimming trips, I took another cycle on the electric bike around the mean streets of the suburbs. I amused myself by looking at the price of houses in Paris. Unsurprising: Paris is dear. Even Malakoff is dear; well over a million euros for a medium sized 3 bedroom house. That night, I discovered that the Princess was obeying the letter if not the spirit of the ban on electronic devices in the bedroom. I noticed that the light in the basement (storage spot for spare pasta, pulses, water, milk and various other essentials) was on and, when I turned it off, there was a shriek of indignation from the bottom of the stairs. Herself was on the phone to her friend. At regular intervals for the remainder of the holiday, I would see her haring down the stairs to talk to some friend or other. The washing machine was there as well and Mr. Waffle frequently ran into her while rescuing the laundry. There’s nothing I like better than beating a long queue and to that end last time we went to Paris we bought the Paris Museum Pass for two people which allows you to push (or glide) to the front of any queue. Of course since if you’re under 26 and European you get in free in any case, the children can skip gaily to the front of the queue with you thus reinforcing their already robust sense of entitlement (mine not yours).